The British Empire & Foreign Countries auction held at GROSVENOR from February 28th to March 1st provided a fascinating global overview highlighting areas of collecting that continue to strengthen or are falling away. Among the latter category one might now place Ireland, joining countries such as Gibraltar, which have also disappointed in recent times. There is, of course, no better time to start collecting countries than whilst they are passing through such phases. Attendance numbers at this first auction of GROSVENOR’s Spring 2018 Season were only marginally affected by the snowstorms that swept Britain during the week with some clients embracing this opportunity to make use of the popular online bidding system, both watching the sale and entering bids directly to the auctioneer. An exceptionally high number of participants in the auction contributed to a gratifying total realisation of £572,847. The auction brought to the market an important offering of Malaya which included the Joe Robertson Postage Dues and Underpaid Mails of Malaya & Bornean Territories as well as the Brian Geden Postal History of Singapore, both being exceptional collections formed over many years including many rarities that drew determined bidding from collectors around the world. 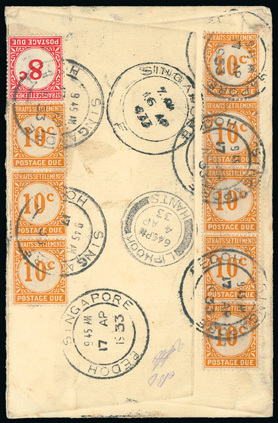 One key lot was the underpaid 1933 airmail cover from the scarce Singapore sub-post office of Bedoh bearing 8c. and 10c. 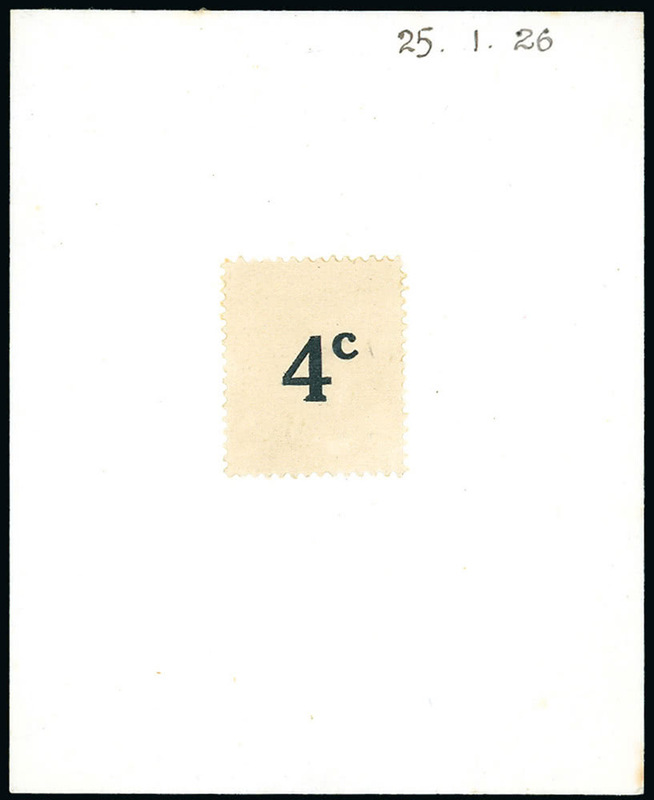 (7) postage dues (lot 973, above) which climbed determinedly to £6,600 and which was said to be “as rare as snow in Malaya”. 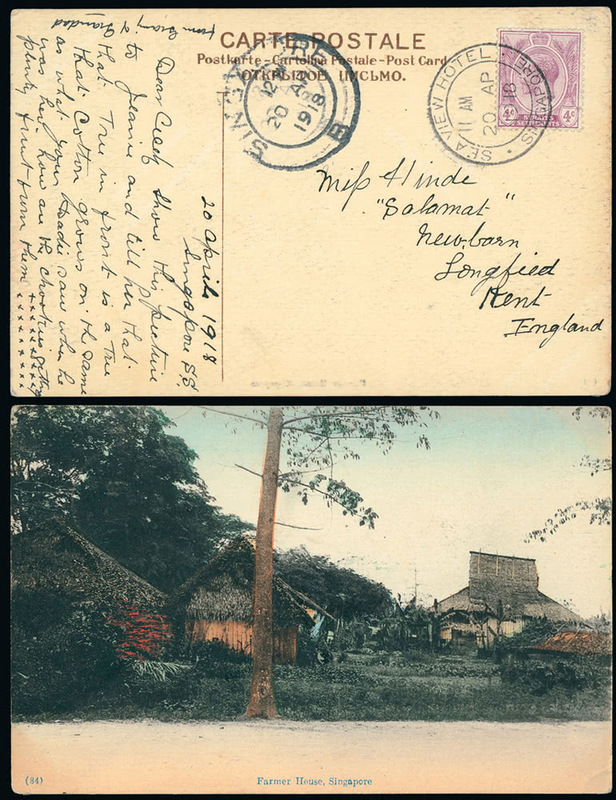 A 1918 postcard showing the scarce Singapore cancellation of the Sea View Hotel (lot 1041, left) achieved £2,760, in fair recognition of this being the finest strike of the c.d.s. seen to date. A most unusual essay, produced by De La Rue in 1926 in preparation for the Straits Settlements 4c. postage due (lot 702) also soared, this time to £2,880. Another important draw in this sale was the second part of the outstanding International Large Gold Medal winning collection of Saint Helena Postal History formed by Stefan Heijtz, FRPSL. 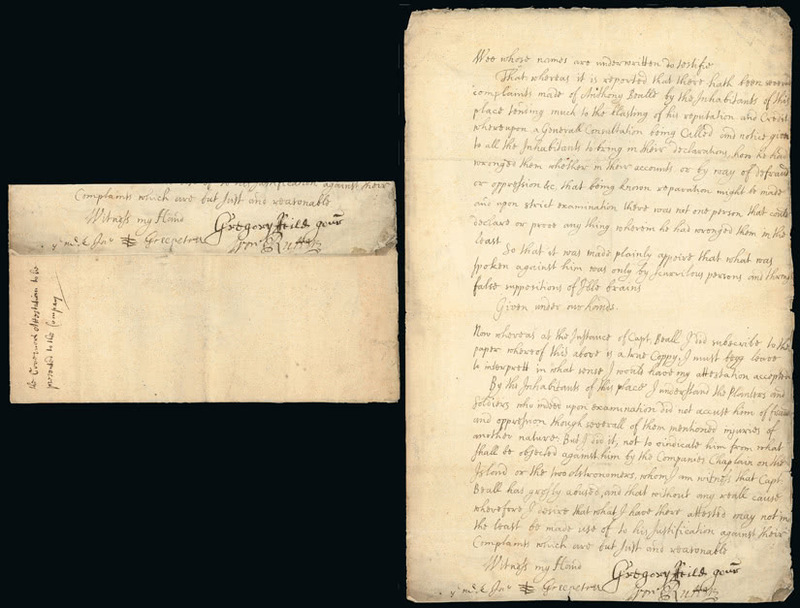 The earliest known letter from the island, an 1677 despatch addressed to the East India Company in London (lot 1265) sold well for £4,298. 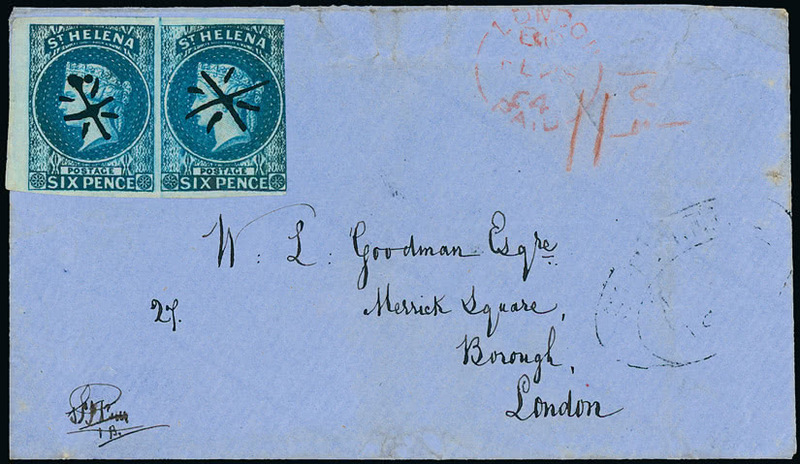 A particularly attractive cover, sent in 1864 franked by a pair of the first issue 6d. with ornamental manuscript ‘sunburst’ cancellations (lot 1323, left) did not surprise when achieving £4,912. There was plenty of interest in the section of India & States, which featured a number of strong collection lots, most particularly those taken from the carefully compiled Matthew Clough collections of Cochin and Travancore. 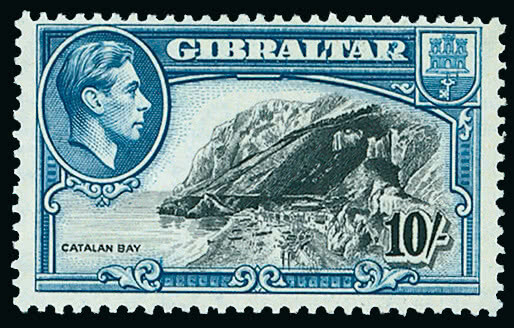 Other notable prices, particularly as they flew in the face of overall trends for their countries, were the £3,348 paid for the mint Gibraltar 1938-51 10s. perf. 13 with broken “R” variety (lot 411), which further confirmed the continuing enthusiasm for K.G.VI material, and £2,838 for the Ireland 1925-28 Seahorse Narrow Date 10s. pair with one showing overprint double, one inverted (lot 564). This last is the only known Seahorse double overprint, one of which appears inverted, and the item more than merited that much coveted designation ‘fine and rare’.